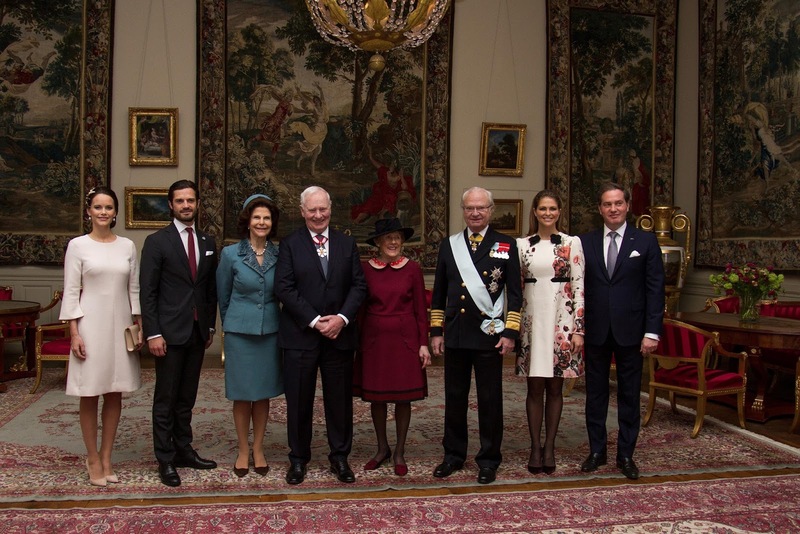 The Swedish royal family welcomed Canada's Governor General for a state visit yesterday with the usual array of not-hats and tiaras, plus some surprises up their sleeves. Surprise #1 (which was not really a surprise because it was announced in advance, but work with me here): Princess Madeleine and Chris O'Neill stepped in for Crown Princess Victoria and Prince Daniel, who are on holiday with their family. For the arrival, Princess Madeleine repeated her perplexing Giambattista Valli dress (if I could just get past the feeling that she hastily slung her headphones around her neck when they interrupted her pre-event study session, I might be able to find the lovely floral dress beneath). Princess Sofia went simple in white and delivered Surprise #2: a version of the Ole Lynggaard gold brooch Crown Princess Mary wore to King Carl Gustaf's birthday dinner last year in her hair. It's definitely an improvement as a hat alternative instead of a tiara alternative (because nothing's preferable as a tiara alternative, duh). And then there was Surprise #3: Queen Josephine's Amethyst Tiara on Princess Sofia! More! Exclamation! Points!! Sofia's on a role: this is her third new pick from the family vault (and her fourth tiara overall), after giving us two different tiaras during the Nobel festivities. This has always been a tricky tiara to style because it has such a large circumference. It sits pretty high and is tilted pretty far back here to compensate, and I really do think it looks splendid on her. I'd probably find it splendid on anyone, but that's beside the point. As if that weren't enough, Princess Madeleine delivered my other favorite colored stone tiara from the Swedish family, the Swedish Aquamarine Kokoshnik Tiara. She wore it with aquamarine and diamond earrings from her personal collection (the aquamarine stones can be swapped for pearl pendants). She wore a new gown from Temperley London, with gathered sleeves and a cut out back. 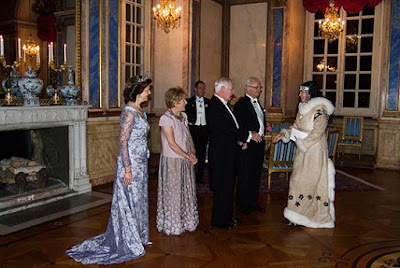 My mind immediately flashed back to Queen Silvia's sleeveless gown from the Nobel Prize ceremony in 1979, which made me wish that this one had ditched the sleeves too, at least for a gala occasion. They'd be great without the orders and stuff. Last but not least, the Pronger (a.k.a. the Nine Prong Tiara) was present and accounted for. I cannot see Queen Silvia's dress without remembering the glory of it paired with the Leuchtenberg Sapphires at the Nobel ceremony in 2012, but I've always been the greedy sort. Check out a full gallery from the banquet here.